Zombie politics—a play on Zombie Economics—refers to ideas about politics that have become so cemented in conventional wisdom that it is virtually impossible to dislodge them. It doesn’t matter what the data says, or what published research says, or what this blog or any blog says. Zombie politics means that even though the ideas are dead, they just can’t be killed. I regret using the by-now-hackneyed zombie metaphor, but it remains apt. Perhaps the biggest political puzzle of our time is why, as the lives of working-class whites have descended from the stability and comfort of “All in the Family” to the chaos and despair of “Gran Torino” and “Winter’s Bone,” these same Americans have voted more and more reliably Republican. 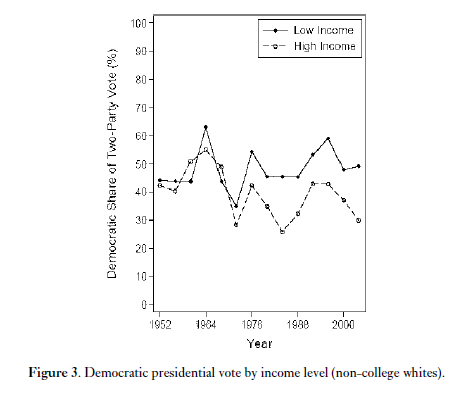 Among whites without a college degree, income has become a stronger predictor of the vote over time. But actually it’s those with less income, not more income, who are more likely to support Democratic presidential candidates. And again, there certainly no trend by which whites with below-average incomes and no college degree become more Republican. 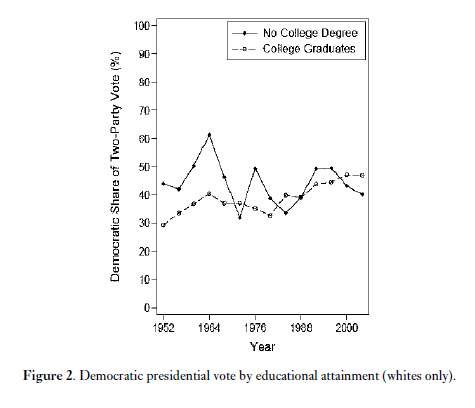 Democratic presidential vote share has declined by almost 20 percentage points among southern whites without college degrees. Among non-southern whites without college degrees it has declined by one percentage point. That’s it. Fourteen elections, 52 years, one percentage point. …he lost his idealism and grew surly, if not violent, consumed with a hatred of hippies, immigrants, blacks, government, and, finally, himself. Sunday’s Times had a fascinating and disturbing lead story about the pattern of government dependency around the country. A map showing areas of greatest reliance on public benefits corresponds with weird exactness to the map of red America: the South, Appalachia, and rural areas in general. But in light of Bartels’s findings, the “exactness” is hardly “weird.” It suggests that we are talking about a phenomenon confined to a region rather than one that describes the white working class at large. For emphasis, one more stab at the zombie: The white working class has not, as a whole, become more Republican. Full stop.